Recently, a magnetic ballast at our living room started to make loud buzzing sound. This made me think what to do with it, replace the ballast with another magnetic one, replace it with some kind of LED solution or use an electronic fluorescent ballast. 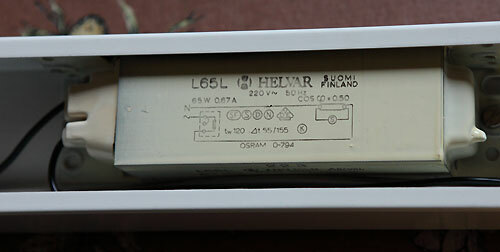 Installed luminaires were as old as our house, built in 1974. I didn't want to replace them with some other solution since mechanical compatibility is not always so great. Fluorescent tubes are still very cheap compared to their performance. And I like to use quality components even if it costs a little more. I think that is better solution in green perspective as it creates less waste. And I like knowing what is inside my things. Another problem with old fluorescent luminaires is that X2 capacitors tend to give out their magic smoke creating a possible fire hazard. I removed all X2 capacitors since electronic ballasts have one in themselves. 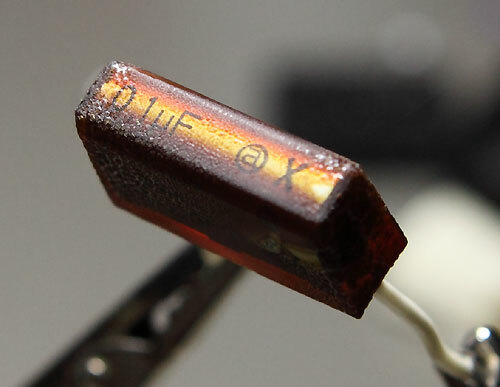 In two cases, the X2 capacitor had lost all of its capacitance. Another luminaire caused distruption to TV reception due to heavy EMI generated when switching the luminaire off. Here is the measurement of the switch-off transient without X2 capacitor, measured across the luminaire input terminals, i.e. at the same point where the X2 capacitor would normally be. Note that the Fluke DP120 differential probe I used to measure this, was not able to record the whole pulse but the measurement clipped at 1.6 kV. Without any doubt, the fuzzy part is responsible for the TV reception disruption, due to extreme dV/dt and resulting radiated and conducted noise. 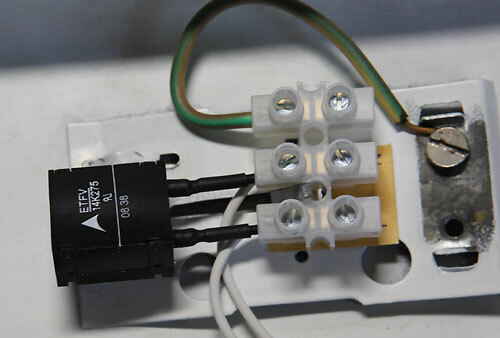 Initially, I didn't intend to change any other than those buzzing ones, but then I realized that by changing old magnetic ballasts to electronic ones, one could reduce the power consumption quite significantly. This of course reduces heat load put out by the ballast, which is nice in some cases. The wall behind one luminaire (the one with the buzzing sound) was already darkened due to the heat from the ballast. At this point, I didn't have any practical experience how much I could expect the real power to reduce. It is well known fact that reactive power will go down quite significantly, but since it is not billed from domestic users, that point is moot. 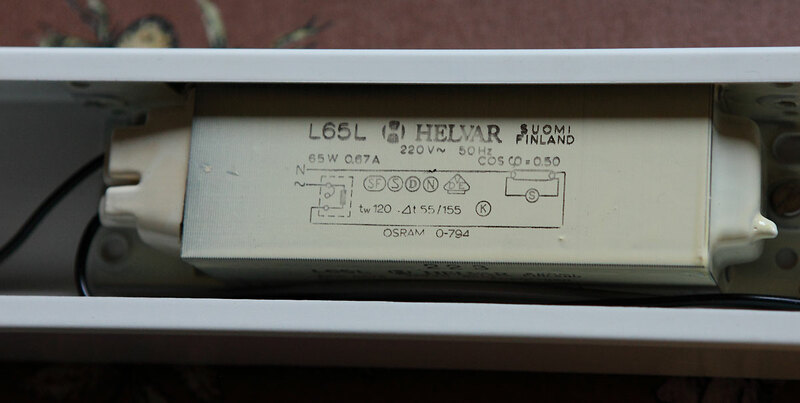 After some studying, I found out that there are some quite affordable Philips and Osram Electronic ballasts available at Ebay. But of course one could get the entire luminaire for less price but this makes me wonder if the ballast is of comparable quality. 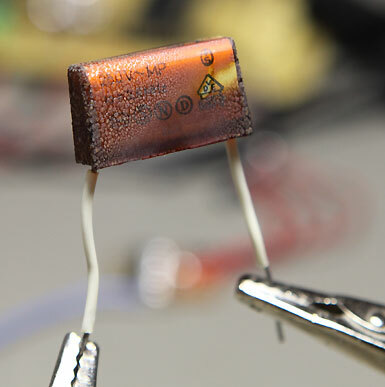 It is so easy to save on electrolytic capacitors. Using electronic ballast gives also some other additional advantages, flickerless light since tube is driven >20 kHz instead of 50 Hz. With 50 Hz, tube extinguishes at every zero crossing of mains voltage so there is a 100 Hz flicker. Startup is usually much faster and more deterministic, tubes just simply turn on instead of long flickering period. Electronic ballast also drives the tubes more gently so they last longer. Fluorescent tube efficacy ramps up when driving frequency is increased so same light level could be achieved with less power. And for most cases, the luminaires became much lighter so they were easier to refit. For each different luminaire, I made extensive power measurements with Gossen Metrawatt MetraHit Energy which I know from past experience that is reliable even for very non-linear loads. 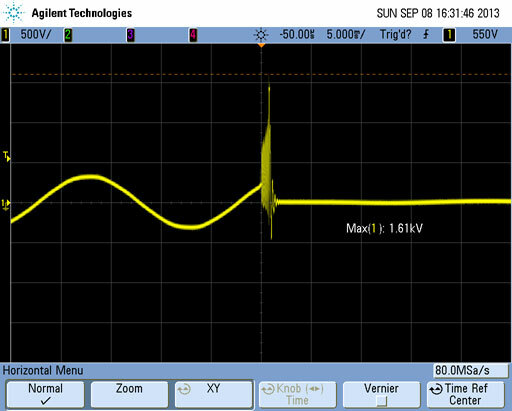 And just for the science, I also measured inductance, DC resistance and ESR of old magnetic ballasts. 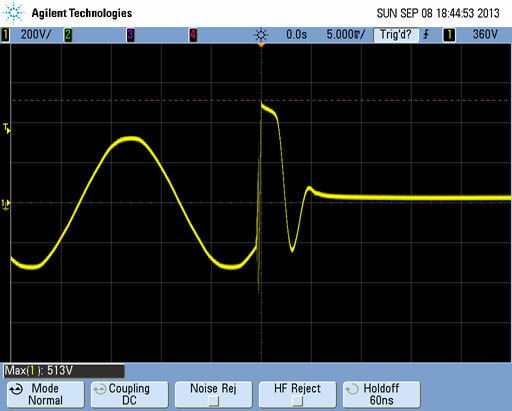 Measurement frequency was 100 Hz, which is lowest what my Agilent 1733C supports. As one can notice that ESR is significantly higher than DCR. This means that magnetic circuit is quite lossy even at this relatively low frequency. Another reason to work systematically on all luminaires was that most of the fluorescent tubes had quite poor color rendering index and not so nice color temperature. For most luminaires, I chose Philips MASTER TL-D De Luxe 90 tubes with 4000K color temperature, which look quite nice. Thus color code is 940, which means CRI>90 and color temperature of 4000K. Basically the only drawback is that the light output is somewhat lower for these CRI>90 ones. I do not like those 3000K ones which look too yellow for my taste (in finnish we call those "kusilamppu"). 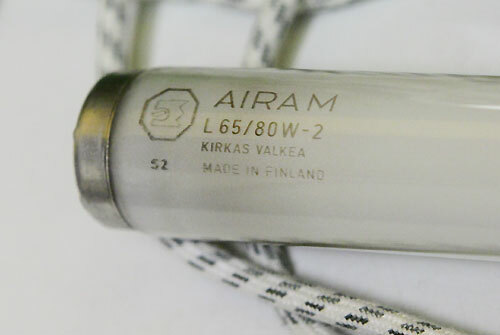 Old T12 tubes in some luminaires were Airam L65/80W-2 "kirkas valkea". There is also MASTER TL-D 90 Graphica if one is really obsessed with the colour rendering index. But of course, efficacy will drop dramatically, which must be then compensated by higher wattage. Some luminaires were really quite difficult and major PITA to reach (behind heavy glass window screwed to the ceiling with no easy way to remove) so I used Philips MASTER TL-D Xtreme in them instead, to increase maintenance intervals. They are only available with CRI >80 so I chose 840 for those. Specified life time is up to 79000h. But equally important thing is the life time of the driving electronics. Osram QTP8 ballast is specified for 100000h life time at 65°C case temperature with 10% failure rate. I expect that combination to last for quite long time. For comparison, ordinary fluorescent tubes are specified only up to 15000h life time, and they still last for several years or a decade. Longest life time can be achieved when tubes are used with warm start ballast, like QTP8. Since luminaires are relatively difficult to reach, and electronic ballasts are more sensitive to line transients than conventional magnetic ones, I decided to put thermally fused VDRs in those luminaires. In addition of those, I have heavy duty Phoenix Contact FLT-CP-3C-350 surge protection device installed in our main distribution panel. When I got power measurements done, I found out that saving of real power is somewhere between 20-30%, sometimes even more. I was a bit surprised by the fact that old T12 tube from 70's used more than 80W and had quite poor light output along with greenish-bluish light color. 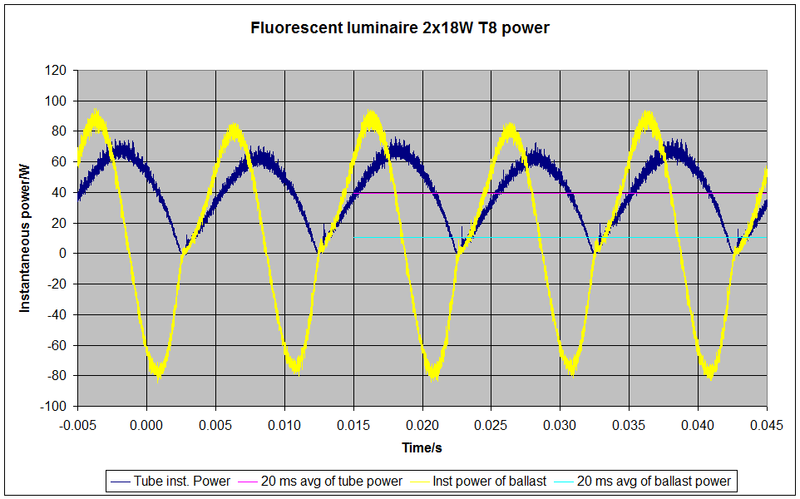 New T8 tubes with electronic ballast used 30% less power. Small luminaires seem to be less efficient than those with more power. I expect ballasts to pay for themselves in 7000-8500h if ballasts do not break down before that. Longevity remains to be seen. But of course and to be fair, here in Finland we do not need much lightning in summer months whenever the weather is warm and in cold winter months the dissipated power goes directly into house heating, so the saving is not so large than stated above, but it was nice to see such a reduction in real power in each case. For background of the saved energy, let's look how power is distributed in a typical luminaire. At late 2011 (thanks to Kai Matula for sending me a luminaire to test! 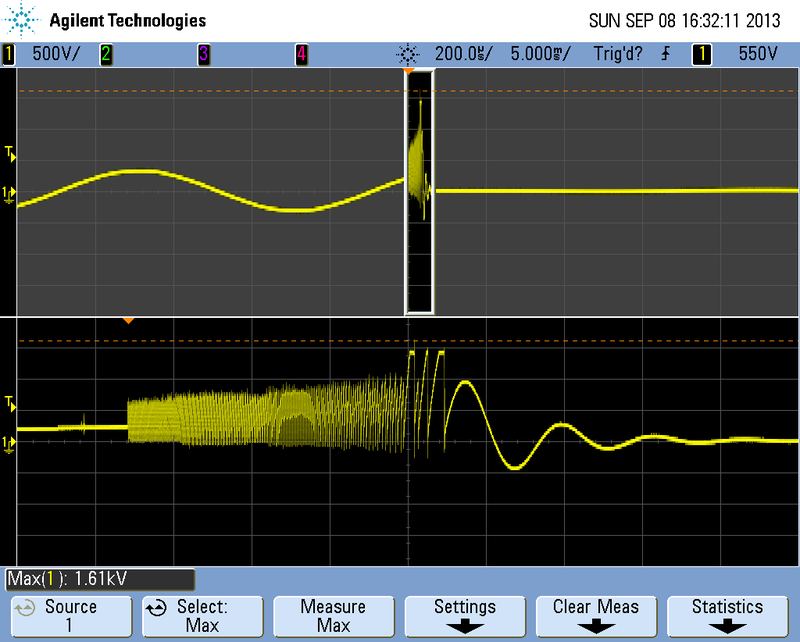 ), I made some detailed measurements with an oscilloscope how power is distributed in a typical fluorescent luminaire. 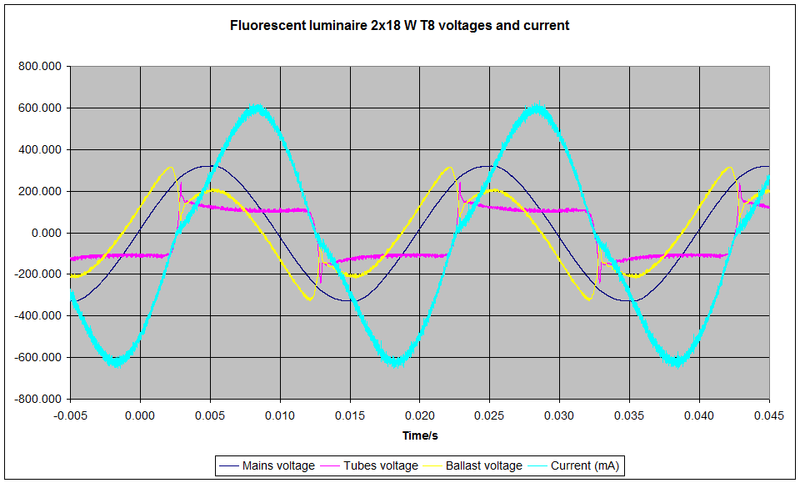 Here is a typical graph of mains voltage, luminaire current and voltages across tubes and across the ballast. 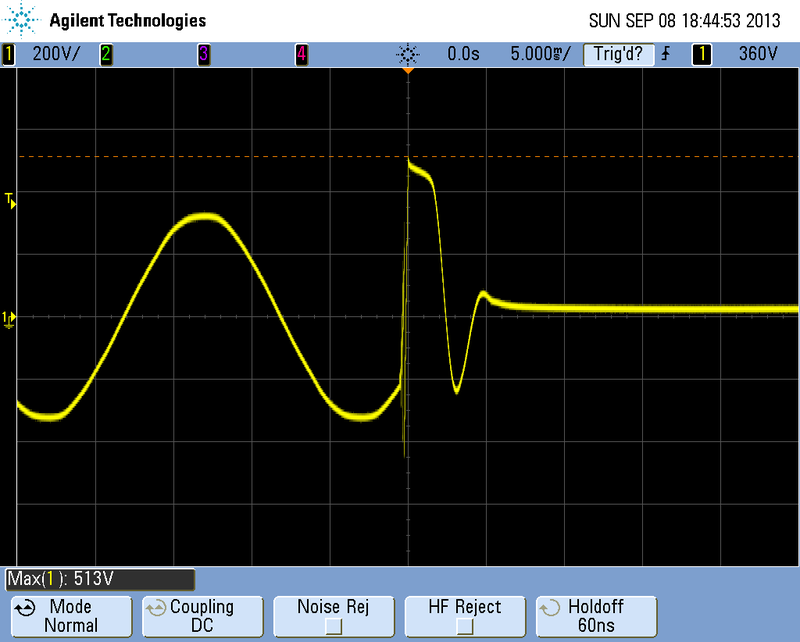 Voltage over tubes seems to be almost square wave. 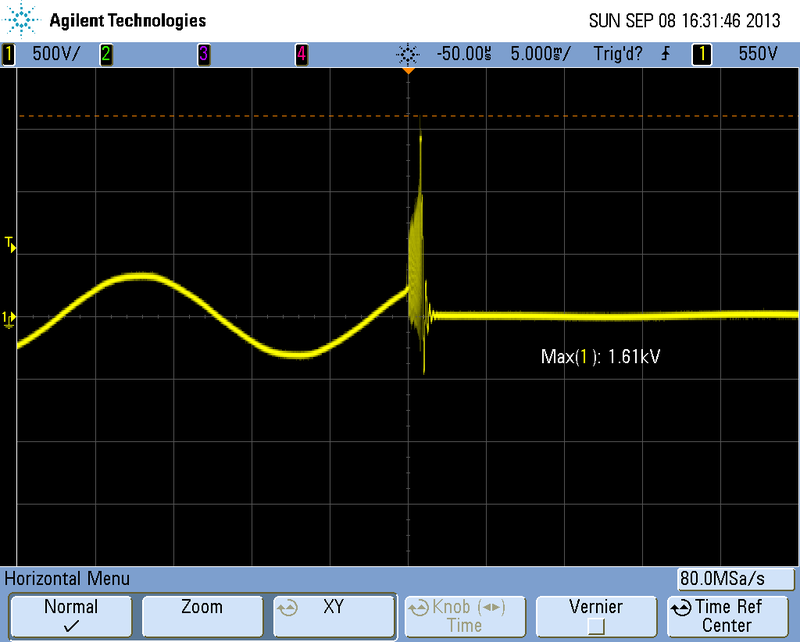 Voltage stays almost constant even if current changes drastically. When I measured this, I started to think what is the power distribution in the luminaire since total real power taken by the luminaire was about 48W, which is considerably higher than nominal 36W. Either the tubes dissipate much more power or the ballast converts the excess power to heat. As you can see, only source of reactive power in the luminaire is the ballast. Tubes themselves use only real power which is turned into heat and via UV-C light, into visible light. 20 ms average of the instantaneous power shows that tubes use about 40W of real power, whereas ballast dissipates 10W. That explains where the extra power goes. About 20% of the total power is just dissipated as heat in the magnetic ballast.